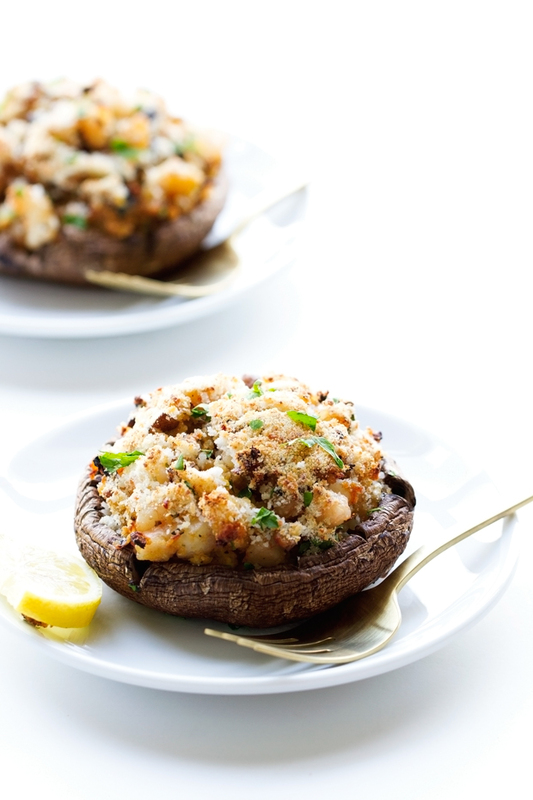 Shrimp Stuffed Portobello Mushrooms that are ready in just 30 minutes! These stuffed mushrooms are loaded with so much flavor, easy to make, bikini friendly, and make the perfect summer meal! 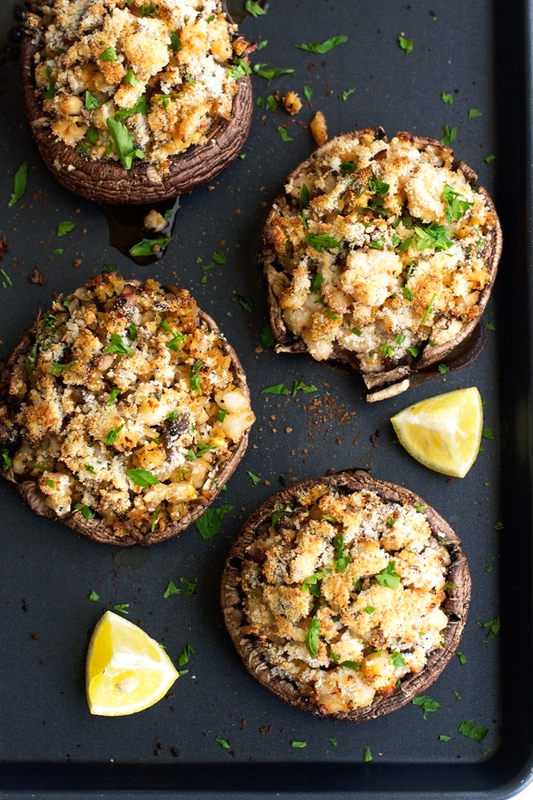 Hearty portobello mushroom caps are cleaned, with the stems and gills removed and filled with an onion-garlic-breadcrumbs-shrimp mixture that’s been flavored with lemon juice and basil and an egg to help bind everything together into happy goodness. We stuffed the mushroom caps and let them hang out for a quick 15 minutes in the oven covered with parmesan cheese where all that magic happens and these stuffed mushroom caps become warm, melty, savory deliciousness. I think this is going to be my favorite summer meal of 2015. Oh my god. These are definitely the best stuffed mushrooms that I’ve made in a LONG time. If you’re a frequent reader of Little Spice Jar, you know how much I stress the importance of buying good quality, wild-caught seafood. Louisiana Seafood  pledges to not only provide the freshest seafood, but also to deliver consistent quality and safety. Did I mention it’s all domestically caught? Yup. You can rest assured that Louisiana Seafood is providing reputable oysters, shrimp, crabs, fish and crawfish that are landed in Louisiana waters. 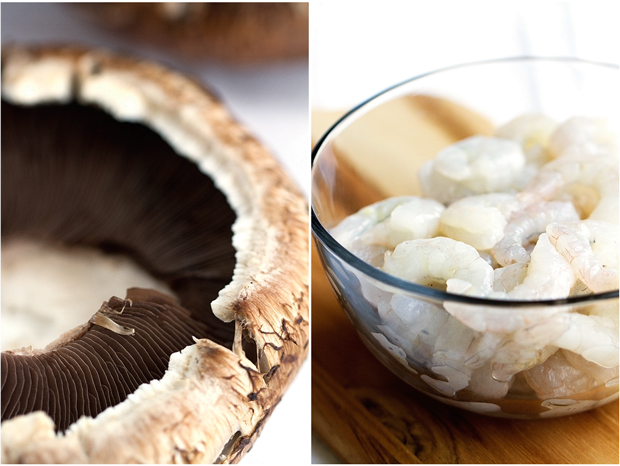 Portobello mushrooms and shrimp are a match made in heaven. What I love most about this recipe is that it’s totally weeknight friendly. Ya-huh! A quick 15 minutes of hands on time and another 15 minutes in the oven while you tidy up the 2 dishes it took you to put this meal together. LOVE those kinds of meals. LESS Dishes = Happier Cook. <– Isn’t that always true? Also, this meal is totally light and bikini friendly. I really feel like I need to be sitting on a beach patio restaurant that’s totally fresco-style everything with a cold glass of mint lemonade, the sun setting in the background and the sounds of waves crashing on shore. Can we all agree that food that transports you to beachy places is definitely amazing? 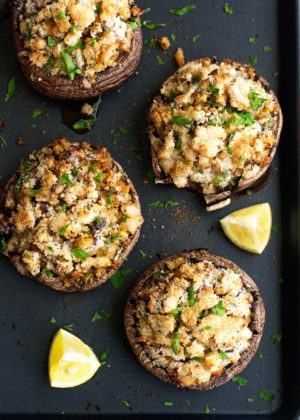 It’s just 30 minutes way with these stuffed portobello mushrooms. 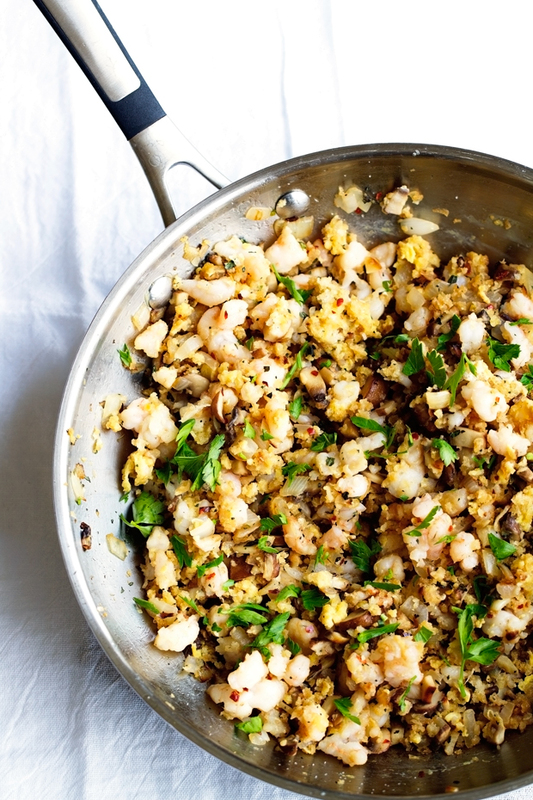 The shrimp stuffing for these mushroom caps is a breeze to pull together. We’re using the stems from the portobello mushrooms along with a little onion and garlic and letting it sweat up in a couple tablespoons of butter. Get ready for it to smell like a little piece of heaven in your kitchen. Once they’re done, add in the chopped shrimp, breadcrumbs, a beaten egg, and lemon juice. Oh and a pinch of red pepper flakes because that’s how we do things here on LSJ. For the hubs and I, a hint of spice is mandatory. Let it all heat up for a quick minute or two until the shrimp are cooked through and opaque. Place that mixture inside the portobello caps and top with a liberal sprinkle of parmesan. Pop them in the oven for 15 minutes and when they’re done, top with a couple additional cooked shrimp, chopped parsley, and basil. I served mine with a side salad and a wedge of lemon. The lightest most refreshing meal you’ve ever had. For reals. Just look at that golden deliciousness. 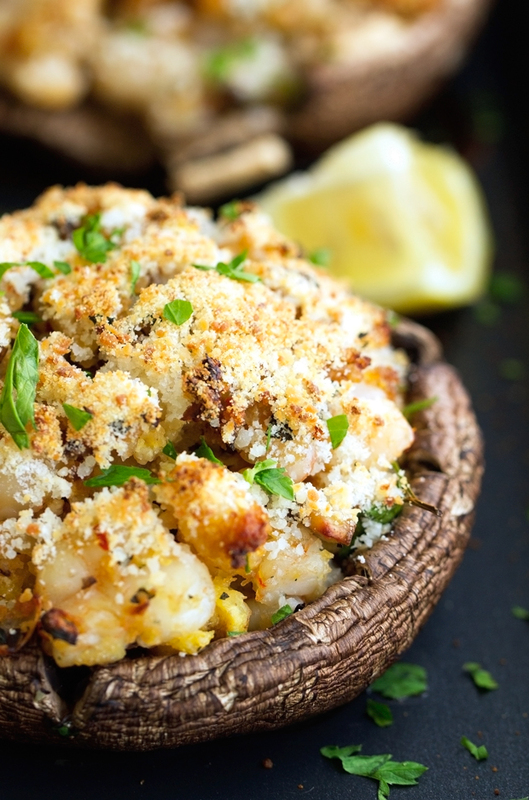 How can anyone not love shrimp stuffed mushrooms? Coastal cuisine is my favorite kind of food to serve up during the summertime. I love adding lemon and basil to my seafood dishes because it makes it so light and refreshing. These shrimp stuffed portobello mushrooms are hearty and filling because of the portobellos and yet still light and flavorful with that Louisiana shrimp and the addition of lemon juice and basil. You totally need these in your life. 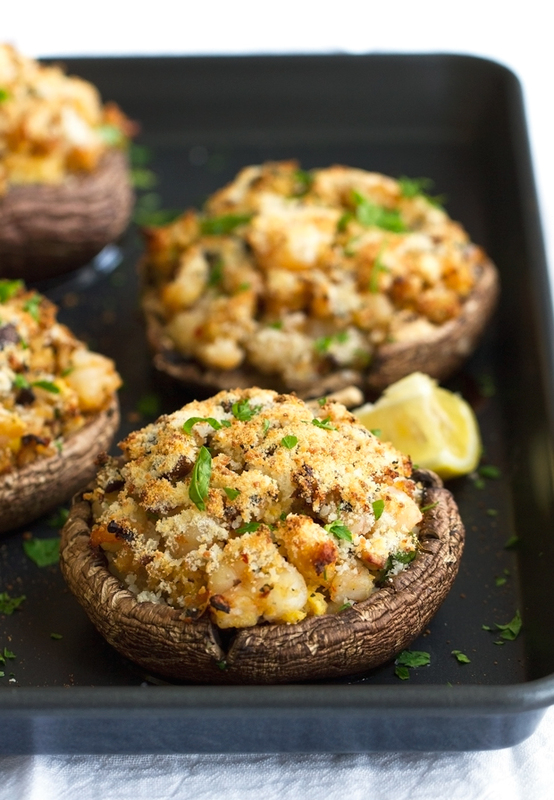 Shrimp Stuffed Portobello Mushrooms that are ready in just 30 minutes! These stuffed mushrooms are loaded with so much flavor, easy to make, bikini friendly, and make the perfect summer meal! Position a rack in the center of the oven and preheat the oven to 425ºF. Remove the stems from the mushroom, set aside. Wipe the mushroom caps clean with a damp paper towel. Chop the stems. Heat the butter in a large skillet over medium heat. When the butter has melted, add the chopped mushroom stems, along with the onion, and garlic and cook for 6 to 8 minutes or until tender. Add in the chopped shrimp, breadcrumbs, beaten egg, salt, lemon juice, basil, and the pinch of red pepper flakes (if using). Cook for 1 to 2 minutes, stirring as needed until the shrimp turn opaque. Place the mushroom caps, stem side up on a baking sheet. Divide the shrimp mixture among the caps and sprinkle with parmesan cheese. Allow the mushroom caps to bake, uncovered for 15 minutes. Top with 2 cooked shrimp per mushroom cap and sprinkle with chopped parsley before serving. What is your favorite seafood recipe? Leave a comment on this post with your favorite seafood recipe to be entered for a chance to win a $100 Visa Gift Card! Entry Instructions: No duplicate comments. You may receive (2) total entries by selecting from the following entry methods: 1. Leave a comment in response to the sweepstakes prompt on this post 2. Tweet (public message) about this promotion; including exactly the following unique term in your tweet message: “#SweepstakesEntry”; and leave the URL to that tweet in a comment on this post 3. Blog about this promotion, including a disclosure that you are receiving a sweepstakes entry in exchange for writing the blog post, and leave the URL to that post in a comment on this post 4. For those with no Twitter or blog, read the official rules to learn about an alternate form of entry. This giveaway is open to US Residents age 18 or older (or nineteen (19) years of age or older in Alabama and Nebraska). Winners will be selected via random draw, and will be notified by e-mail. The notification email will come directly from BlogHer via the [email protected] email address. You will have 2 business days to respond; otherwise a new winner will be selected. The Official Rules are available here . This sweepstakes runs from 6/10/15 – 6/28/15. Be sure to visit the Louisiana Seafood  brand page on BlogHer.com where you can read other bloggers’ posts! Full Disclosure: This post has been sponsored by Louisiana Seafood and SheKnows Media. Though I did receive monetary compensation for this post, all opinions expressed are my own. Thank you for supporting the brands that support Little Spice Jar!